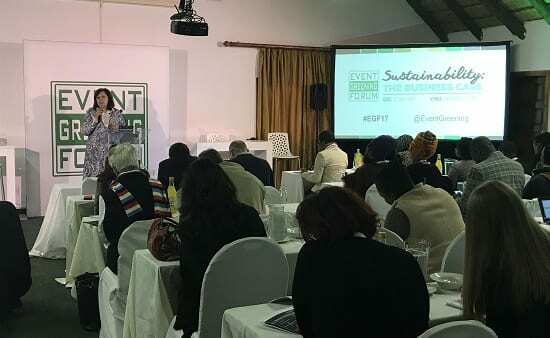 In her official opening address for the Event Greening Forum (EGF) 2017 Conference, on 27 July at Valverde Eco Hotel, Amanda Kotze-Nhlapo said sustainability within the business events industry is no longer negotiable and outlined a strategy to promote it. Kotze-Nhlapo is the Chief Convention Bureau Officer for South African National Convention Bureau (SANCB), an organisation under the umbrella of South African Tourism (SAT). SANCB is tasked with growing the business events industry (also known as MICE – or Meetings, Incentives, Conferences and Exhibitions). Roughly 112 000 meetings were held in South Africa last year, contributing R115 billion to the economy, Kotze-Nhlapo revealed. With business tourists spending three times as much as leisure tourists and delivering a high return on investment, SANCB has a vital role in boosting the country’s economy. Part of SANCB’s strategy includes improving the sustainability of the business events sector. This will help to win more international bids to host lucrative events, while also creating economic opportunities for South Africans. “We want to make the pie bigger, so everyone can get a slice of it,” added Kotze-Nhlapo. “We want to partner with the Event Greening Forum as the lead organisation towards sustainable growth, while working with all of the other associations in this space, such as SAACI, Fedhasa, SATSA, EXSA and AAXO,” Kotze-Nhlapo announced. The EGF is a non-profit organisation whose mandate is to promote event greening, or sustainable, practices within the MICE industry through education and awareness. It has also created minimum Sustainable Event Standards which will ultimately be translated into Sustainable Event Certification. SAT will sign an MOU with the EGF, with goals to educate those in the industry, showcase innovative greening and sustainability initiatives in Africa, and create inclusive growth opportunities for SME development through mentorship and up-skilling. Other methods to promote sustainable event practices include introducing compulsory green audits for events, and ensuring all of SANCB’s bids contain a minimum criteria for event greening. National Treasury recently awarded R90 million to South Africa’s business events bidding fund, which will contribute towards these goals. The Event Greening Forum (EGF) is a non-profit organisation that aims to promote sustainability within the business events sector. The EGF was established through dedication and support of eight industry associations who are recognised as founding members. The founding members are key industry associations working together to promote South Africa as a destination for various types of events. They host educational sessions for industry and lobby government in an effort to implement sustainability principles into the daily operations of the events industry. Event greening myths – busted!